Two Seater Westoe Sofa in a Kintyre Chambray Fabric An excellent high quality 2 Seater Sofa featuring a high quality fabric and light oak Queen Anne Style Legs. 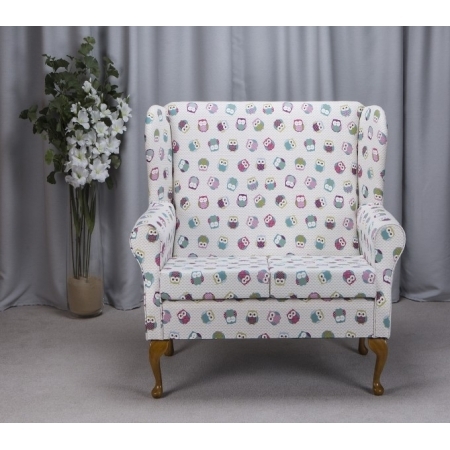 2 Seater Westoe Sofa in a Novelty Time Owl Print Fabric. 2 Seater Westoe Sofa in a Novelty Time Owl Print Fabric.We do this style of sofa in any fabric you see on our site, or alternatively we can upholster in your own fabric as you wish. Please note all fabric must be fire retardant for us to work with. 2 Seater Westoe Sofa in a Chartrious Bling Fabric with Stud detailing. Two Seater Westoe Sofa in a Tatton print Fabric An excellent high quality 2 Seater Sofa featuring a high quality fabric and light oak Coloured Queen Anne Style Legs. Two Seater Westoe Sofa in a Balmoral Sky Fabric An excellent high quality 2 Seater Sofa featuring a high quality fabric and light oak coloured Queen Anne Style Legs. We do this style of sofa in any fabric you see on our site, or alternatively we can upholster in your own fabric as you wish. Please note all fabric must be fire retardant for us to work with.